This being the second part (of three) of the interview, the reader should really read Al Hodgson Interview, PART ONE and Introduction HERE. Need PART THREE? Go HERE. This is the second fifty minutes of an interview that lasted over two and a quarter hours. The rest will be posted here soon in one more segment. View Part One through the link above first! This interview was conducted with Al in his Willow Creek home, off Hodgeson Road, by Steven Streufert, with assistance from “C.I.” (who wishes to remain anonymous). Preparation of question background was assisted by “K.A.,” also anonymous, and aided by the ever-perspicacious Daniel Perez. Our investigation of the film site location was also aided by Cliff Barackman, James Bobo Fay, the above two, and many others on the ground and along the way. 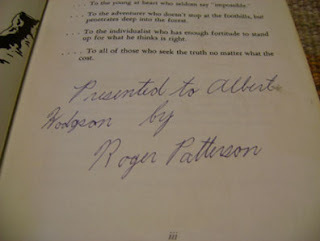 Images: Above, Al Hodgson in his home, 2010, a bottle of "Bigfoot Red" wine in the background; below, the presentation page of Roger Patterson's book, inscribed personally to Al by the author (the dedication lines: "To the young of heart who seldom say 'impossible'; To the adventurer who doesn't stop at the foothills, but penetrates deep into the forest; To the individualist who has enough fortitude to stand up for what he thinks is right; To all of those who seek the truth no matter what the cost." Photos by Steven Streufert. CLICK TO VIEW ENLARGED. BIGFOOT BOOKS: But, you were running the store, and probably got a lot of reports coming in at that time? (40:38 of 2:17:11) Now continuing…. AL HODGSON: I did, and I….What really got to me, or how I really got into this thing—I’m sure you heard about Betty Allen? BIGFOOT BOOKS: Betty Allen the journalist? BIGFOOT BOOKS: What did R.F.D. stand for? I’ve never been able to figure that out. AL HODGSON: Well, that was a name for a post office… R.F.D., what was that, it was a name on the post office. BIGFOOT BOOKS: Yeah, yeah. Didn’t Andrew Genzoli write that after, later on? AL HODGSON: Yeah, it was his column. But Betty was a reporter, but she was also a guest on his column. So, she was the one that got to me, she kept after me. BIGFOOT BOOKS: And she lived up here in Willow Creek? AL HODGSON: Oh yeah. And see… Did you know Lincoln Martin? 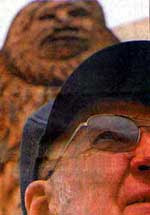 Images: Above, Genzoli with Jerry Crew and footprint cast, archival, Humboldt Times; below, Al Hodgson with the Patty creature, speaking at the 2007 PGF Anniversary Celebration in Willow Creek. Photo: Steven Streufert. AL HODGSON: I think somebody else was taking her up there before, but she didn’t want to go by herself. But anyway, she talked me into taking her up, and I got hooked to it. I saw some tracks. Well, they knew there were some tracks there, and they had them covered in big pieces of bark, so that, the trucks'd go by they just dust them out, they get covered in dust. They just covered them with bark so that the tracks would be there. So, anyway, we went up there and made casts, and then I found some tracks down in the creek. And Francis [Al’s wife] always will say that they’re fake. BIGFOOT BOOKS: And she still doesn’t believe. I always heard that she was a hard-core skeptic. C.I. : And when were these first tracks found? AL HODGSON: Sixty-seven or something like that. I can’t remember. I can’t remember now. BIGFOOT BOOKS: So it took you almost a decade to become more interested in the Bigfoot stuff? AL HODGSON: Yeah, she [Betty Allen] pushed me into it. And I took her up there. And I had a cast laying on the counter there at the store and, at the second store, you know where the pool hall is today? BIGFOOT BOOKS: Yeah. Oh, you were over there? AL HODGSON: Ah, and the third store, we had that…. But anyway, it was in there, and the cast we had made up there, anyway, I had it laying on the counter. And a lady came in and she said, you know, that’s the same thing we had over at our house, ten years before. OK….? AL HODGSON: Yeah, that’s right. I didn’t believe it! Anyway, same time, got all those things, they sparked the interest. That time, I don’t know who came by the first time. John Green came down and they had the… Northwest… what they call it? 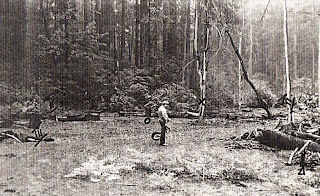 BIGFOOT BOOKS: Pacific Northwest Expedition? Image: The Pacific NW Expedition crew at their base at Louse Camp, Bluff Creek; Tom Slick second from left, with Rene Dahinden, Bob Titmus and others. Archival. AL HODGSON: I wasn’t… It was just across the street [Wyatt's Motel, where the PNE met], but I…. BIGFOOT BOOKS: You never met Tom Slick, or anything? AL HODGSON: No, I wasn’t interested. 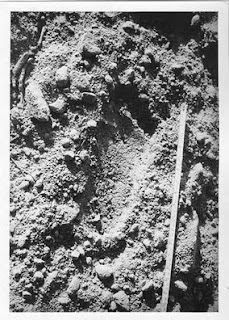 BIGFOOT BOOKS: Do you think they were out to shoot a Sasquatch, or were they just afraid they might have to defend themselves? AL HODGSON: Well, I think, what he was saying was that they’re dangerous, they’re liable to kill ya! BIGFOOT BOOKS: Like maybe on the streets of Willow Creek, hmm? AL HODGSON: Yeah yeah right. But anyway he was, I didn’t know any of the guys at the time. Now, Peter Byrne his brother was here. I remember him, but I don’t remember seeing Peter. And after Betty Allen got me interested, and they got the word out, then they started stopping in the store to look. Well, first off it was Roger Patterson. BIGFOOT BOOKS: When did you first meet him? AL HODGSON: I don’t know. I can’t tell ya. BIGFOOT BOOKS: Was it ’66, or sixty…? AL HODGSON: All I can tell you is that it was before his book was printed. 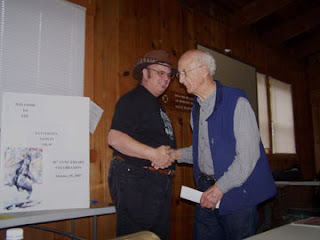 Image: Passing the torch between two generations, Al Hodgson with organizer Tom Yamarone, after speaking at the 2007 PGF Anniversary Celebration in Willow Creek. Photo: Steven Streufert. BIGFOOT BOOKS: That was ’66, right. Now, I think he got started in 1963… or something? AL HODGSON: Well he had to have… As a matter of fact, he gave me this book. AL HODGSON: But you know, I was surprised that he lived that long. See, he had the Hodgkin’s disease. AL HODGSON: Now, I know about Hodgkin’s disease. Francis’ grandmother had it. Terrible, terrible death. BIGFOOT BOOKS: It’s a form of cancer, it’s debilitating, how is it, in the lymph system…? AL HODGSON: Yeah. From what I can recall they said she had bumps, all over her body. BIGFOOT BOOKS: Roger was such a strong guy, known for his physical performance in rodeo and acrobatics and things like that. BIGFOOT BOOKS: And he really lasted a long time. He was ill before the movie was even shot. AL HODGSON: And what they did, and he told me was, and, I didn’t ever expect to see him again. Because of knowing what happened to Francis’ grandmother. But then, John Green told me was, he had this chemo, and he thought he’d die, almost did die, from the chemo, but it brought him through it, and after that, he got the film after that. BIGFOOT BOOKS: And he was kind of a health nut, drinking lots of juice, and nuts and berries and stuff. He just wanted to cure himself. He was a really determined guy, and… Everyone likes to think of him as either a hero or a hoaxer. What was your feeling about Roger when meeting him, as far as his character and his honesty, or his sense of humor, or whatever you want to say about him? 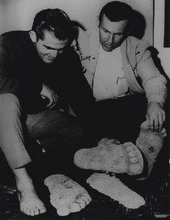 Image: Roger Patterson with the Bluff Creek Patty footprint casts. Archival. 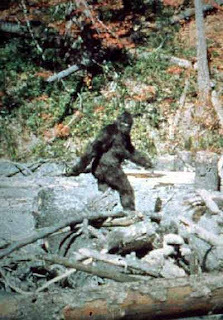 Some say this photo was taken by Larry Lund, in Yakima, WA after their return from Bluff Creek... is it true? AL HODGSON: Oh yeah, he was. That’s right. BIGFOOT BOOKS: He wasn’t out to do something fake. He believed in it. AL HODGSON: And you can see all of the evidence, that research that went into his book, there’s quite a lot there. AL HODGSON: Yeah, many times. 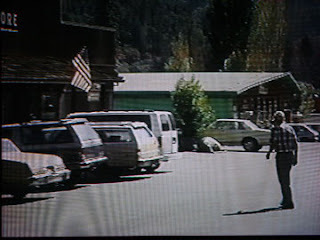 BIGFOOT BOOKS: He was down here how many times, like before the film? Do you remember? AL HODGSON: I can’t remember. 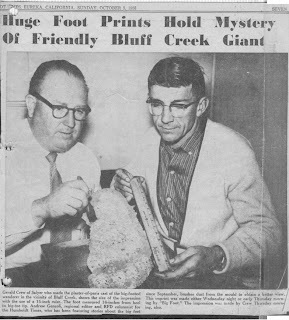 Image: Historical, Roger and Bob Gimlin pose with the casts they made at the site of the Bluff Creek film. 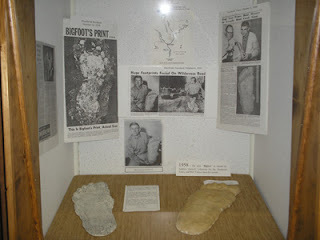 BIGFOOT BOOKS: There were at least three that I read about, that he was down here. And Bob Gimlin, too, did you meet him? AL HODGSON: I can’t say I remember seeing Bob before the film. Now I don’t say, or didn’t, I don’t remember. C. I.: Had you met Roger and Bob in town that October before that night they came in with the film? Had they stopped in previously on that trip? AL HODGSON: No, no. See, what I think they did... I called, and then I didn’t see them until afterwards. The reason being, they came down from the north, down the 96, I-5 from Yreka down the 96. So they didn’t have any reason to come out here, and I didn’t see ‘em until afterwards. 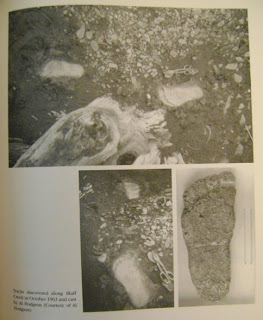 BIGFOOT BOOKS: But you are the guy who called, after the Blue Creek Mountain tracks? And John Green had talked to you, right, and had left and gone back to Canada. That would have been late August to early September, according to John Green’s book. AL HODGSON: Yeah, I think so. It was still summer. BIGFOOT BOOKS: And after that you called? 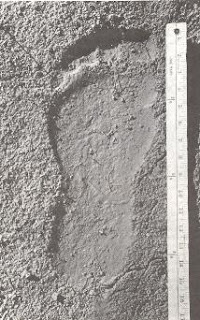 Images: Above, one of the BCM trackway prints (looking suspiciously like one of the footprint stompers that Ray Wallace made--or did Wallace copy these?) Below, Patty on Bluff Creek. MK, if you want to see RED just look at those red leaves in the background--you don't NEED "three clicks" of exaggeration. AL HODGSON: Yeah, he asked me to call, and I didn’t know John and Roger’s--they might be at each others’ throats or something else--and so I didn’t want to call and talk to ‘em. So I waited until John left and I called Roger, and Roger said, well, I said they probably left the area by now. And he, Roger, said, "Well, I think I’ll come down anyway. I’ve been wanting to come down anyway," and he came down. I understand that, and I didn’t know this, but Gimlin had to make arrangements, because he’d been working. He couldn’t just take off and go. So, he had to make arrangements before he could go, and so that delayed them coming down a little bit. And that’s one of the reason it wasn’t until October that they finally got the film. BIGFOOT BOOKS: Apparently he said he had an on-and-off job, like he would work two weeks, and then have two weeks off, or something? AL HODGSON: Yeah, yeah. And he had to have someone cover for him. I don’t know. BIGFOOT BOOKS: So, definitely, you called and it was in September by then, and they came down probably a few weeks later? BIGFOOT BOOKS: You don’t know, they didn’t call you when they came in? They definitely called you on October 20th, after the film. When you called, if you remember, when you called did you talk to Patricia Patterson at first or was it Roger at home? You’ve probably heard this question before. AL HODGSON: I don’t know. I don’t remember. 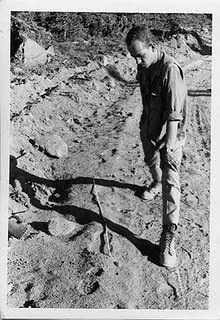 Image: Promotional photo of Al from the Willow Creek-China Flat Museum, home of the Bigfoot Collection Al helped to establish. It houses the Bob Titmus materials, and current rumor has it that it may also hold the John Green archives someday (hopefully that day is a long ways off). AL HODGSON: Yeah I just don’t remember. I can’t say. I’d like to say “yes” on the phone, but I just can’t do that. AL HODGSON: I know, I know. Well, you know, see, they’re trying to, for whatever reason… I don’t know why they’re trying to do this! BIGFOOT BOOKS: Well, it’s accusing them of murder, isn’t it? Because they’re the very same people that believe Bigfoot is human, MK and Dave Paulides, they’re both “Human” believers. 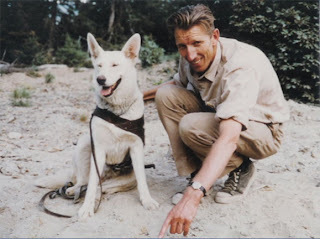 Image: John Green on BCM, with the "killer" dog, White Lady. Yeah, right, MK! That smiling dog John is petting sure looks vicious to me. AL HODGSON: I didn’t prove it, but when I, I don’t know where he got that. We met the plane, up there [in Orleans, in August 1967], I took my station wagon up and we met the plane. My oldest son, Mike, he and the handler, I guess, was in the back, and then, maybe there was three of them back there. John and I, I was driving, and then Dahinden. Four adults and one…. 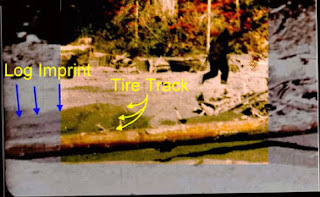 BIGFOOT BOOKS: Then this guy [showing the pilot photo, see image] wasn’t with you at the time? BIGFOOT BOOKS: John Green says “Thanks to Al Hodgson we were met with provisions at the Orleans airport.” And then it doesn’t really say whether you actually came out or not. AL HODGSON: I don't remember. I don't have any idea. But, I talked to my son the other night, and I said, Mike, tell me, do you remember the incident of us going up there in Orleans, and picking them up, and taking them up there. And he says, the only thing I remember is going up to the airport, because that was such an uphill airport. You had to land uphill. And they used to kid about it, because, they kidded about flying into Orleans, because you landed there straight up, coming in. Taking off, you had to fly around the barn! BIGFOOT BOOKS: It was kind of a narrow approach, wasn't it? AL HODGSON: And I said, I do not give your phone number out, I tell them whatever information I can, but I will not give your phone number out. I just wouldn't do it. BIGFOOT BOOKS: So, basically, you went back to Willow Creek after that. You didn't go up to Blue Creek Mountain and look at the tracks that time? AL HODGSON: No, I had the store to run, and I went back down. And that night Francis closed the store, and the next day I had to open it up and, no, so I was busy. And I did not go back up. Now, I remembered, and I can't even think of the guy's name now, that came down from the Museum, and I can't even remember now, Provincial Museum, or something like that...? BIGFOOT BOOKS: Oh, Abbott? Don Abbott, I think. AL HODGSON: Yeah. Abbott, yeah. 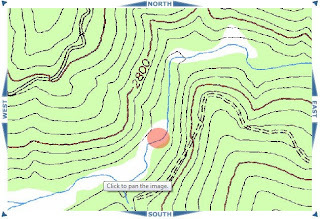 Images: Above, topo of the Orleans area, CLICK TO ENLARGE. Also, Don Abbott on the BCM site, removing a track that has been solidified in the ground with glue. BIGFOOT BOOKS: He took a few days to get down, from B.C. AL HODGSON: They had to get a hold of him and they, it took some time. 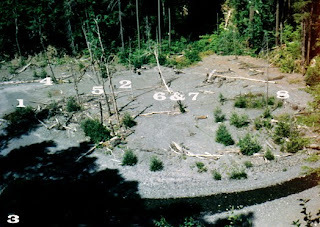 BIGFOOT BOOKS: John Green says, kind of vaguely, two days or so, Don arrived, and while they were waiting they heard about the tracks that were down on the sandbar, that were supposedly a few hundred yards downstream from the PGF site that... was going to be filmed later. So, then what happened after that...? Where were we? AL HODGSON: I don't remember. C.I. : We're still at John Green's second trip, in the summer of '67. BIGFOOT BOOKS: Yeah, well, just going back to the timeline, in late August he came down here for the Onion Mountain stuff, and then left after, I assume, a few days. He doesn't say how long he was down here. AL HODGSON: I don't even know if I saw him, when he was down, or not. AL HODGSON: Well, he might have. 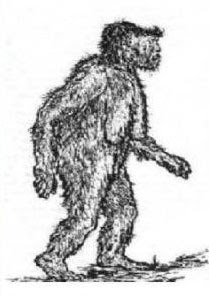 Image: One of Roger Patterson's pre-PGF illustrations of a female Bigfoot creature. BIGFOOT BOOKS: At that time, meets Al of Willow Creek, and also meets Mrs. Ryerson, and then drove back to Canada. BIGFOOT BOOKS: Well, my bookstore, I don't do that either. Eventually it starts to sink in, you get to know enough people, it starts to sink in, so that, oh, that's Ken, the Bigfoot guy, who has a Sasquatch on his property over in Oden Flat. After seeing him about ten times, he's slowly starting to tell me more and more. AL HODGSON: It's hard to remember, and I'm amazed I remember as much as I do! BIGFOOT BOOKS: Well, you're sharp as can be, I think. C.I. : It's great to have this opportunity, to get some more questions on record, for the future. And these, these crazy stories on the internet... will come and go. BIGFOOT BOOKS: Ohhhhh! Well, some of those things I don't even mess with. C.I. : Well, some of them are just based on the silliest of minor technicalities. It's almost not worth the time. Images: Above, Al Hodgson walks in front of Hodgson's Store, Willow Creek, before it closed and the building became home to a clinic. Below, the Museum's sign proclaiming Bigfoot and Historical Exhibits. Al was a curator, and is still involved. Taken from an A-and-E television documentary. AL HODGSON: And that's when the fires started flying. BIGFOOT BOOKS: And what did you feel when you got that email from him? And was there any precedent for it? AL HODGSON: I told him, it was wrong. I told him that that's not right. There's no way. And I told him why. But you know, sometimes you can get something in your mind that's so tough it is hard to, regardless. But I know better. But I, MK was somethin'... he had the habit of coming here late at night, ten o'clock in the evening, at night, and wanting to talk to me. BIGFOOT BOOKS: All the way from Mississippi? AL HODGSON: And it was OK, but not all the time, you know. There's times you cannot help. But this last time he was telling about how, they killed one and this is a skin over here, and it was buried, and uh.... And I said, in the first place, what did they do with the skin? What did they do with it? They buried it. But why? Why skin it if you're going to do something else with it. And what about the carcass? They buried it. With what? A backhoe! And I said, wait a minute. There's no backhoe down in that creek. And I said, I was there the next spring and there was no tracks. AL HODGSON: But that's, that picture, beginning with, that's Blue Creek Mountain, and the film site was down in the creek. Images: From Dahinden BCM film and the Patterson film, lettering applied by MK Davis. AL HODGSON: Yeah, I know. AL HODGSON: Well, John was going to call me about that, let me know about that time of year, was there frost, we got, was it leaves turning at that elevation. What I did, I went and checked the elevation up there, and then found a place here about the same elevation. AL HODGSON: Well, the creek is not that high. AL HODGSON: Very similar. Not quite three thousand. Image: One of the OM-BCM tracks in dirt roadway conditions. Archival. BIGFOOT BOOKS: So we’re talking pretty close to our local hills here. AL HODGSON: Yeah. And at early October the leaves are turning red up there. AL HODGSON: No, September they really don’t. It seems like it’s October, and now, some years, it might be a little later. BIGFOOT BOOKS: I’ve been living up here, or coming up here, since ’93 or so, and I always remember the fall leaves. It’s always October. AL HODGSON: I like this map here. 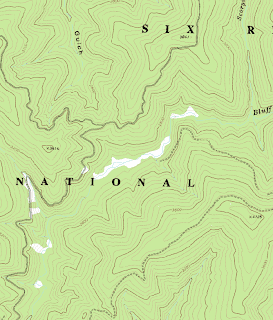 [Looks at the Six Rivers Forest Atlas] You got it down at the station? 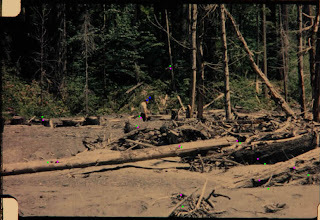 Image: Bluff Creek headwaters area, image from C.I. 's GPS unit. CLICK TO ENLARGE. BIGFOOT BOOKS: Yeah, from the ranger down at the station. Since we’ve mentioned the ranger, can we talk about that night of October 20th, 1967? There are all these questions about the timeline, and apparently Roger came and told you that they went over Martin’s Ferry Bridge? And there’s questions about whether you could go over the Bald Hills Road, or go to Eureka over the 299, coming down the 96. And also, these other things, whether there was an airport used or a post office…. I’m sure you’ve heard this a million times, but it would be really good to clear it up, I think. BIGFOOT BOOKS: In Eureka, that big red brick building there? It’s like three or four stories tall. AL HODGSON: Yeah, it’s on 4th Street. It’s on H Street, and I can’t remember what, maybe it was 5th or 6th or…. Yeah, anyway, he told me he mailed it there. 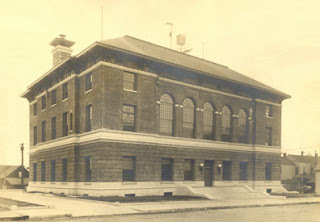 Image: historical, the Eureka Post Office, 1910, where Roger told Al the P-G film was mailed. 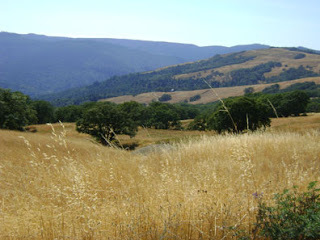 Below, Bald Hills, Humboldt County, photo by Steven Streufert. BIGFOOT BOOKS: Now how could… I’m not saying he’s lying or making up something, or you’re not remembering correctly, but I’ve always been puzzled by that. The post offices probably closed at 5:00 then, as they do now. Right? How could they have done that if they left around 3:30? Is what Bob Gimlin says…? BIGFOOT BOOKS: …and came into Willow Creek…? Oh, they left from Louse Camp area where they were camped, and got out over the road and into, well, over Bald Hills Road or else over the 96 coming into Willow Creek. And Gimlin in his 1992 interview with John Green says he came from the film site to town to see Al Hodgson, which I assume, “town” meaning Willow Creek first. Is that how it happened? AL HODGSON: No, no. Now, I should say, I don’t want to say that wasn’t how it happened, that wasn’t what Roger told me. Roger told me that they went over Bald Hills, over to Orick, and then to Eureka. Now, could they make it there before the post office was closed. Yeah. I think, but whether they could make it there, and then over to Willow Creek by that same time, well, I don’t know. By shortly after 6:00? BIGFOOT BOOKS: Well, it took me almost two hours to from up near the Bluff Creek Bridge or whatever, to go up over the Bald Hills Road over to Orick, it took me like an hour and forty minutes. And then it’s like forty some [more] miles from there into Eureka. And probably out from the film site to the 96 it’s got to be at least a half an hour, I would estimate closer to an hour to get out on those dirt roads. So, I mean, it’s like 3:30, 4:30, 5:30… they’re not getting into Eureka until it’s like 7:00 or something, on that route. Whereas if I come down by Willow Creek, it’s only about thirty miles from Willow Creek to Weitchpec and the Bluff Creek area there. But, right by the road to Fish Lake, it’s 29 miles. AL HODGSON: I never tried it. I thought, how can you make it down there and back to Willow Creek, and make it back by shortly after 6:00? AL HODGSON: Well, it’s possible, see. I don’t know. But I have no way of knowing. BIGFOOT BOOKS: You don’t know, aside from what Roger said about going over Bald Hills and stuff, is it possible that they came to see you first? AL HODGSON: No, I don’t think so, because, unless they went back after… See, what they told me was, they were anxious to get back to the horses. And when Syl McCoy called and wanted to meet with them, and we talked then for some time, oh, I don’t know, and hour, maybe two maybe. 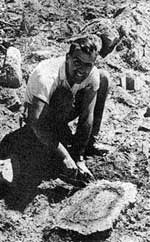 Image: The Byrne film site photo, featuring Mike Hodgson, Al's son. 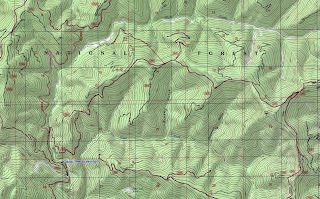 The two below the maps are by Green and Dahinden, respectively. Historical. 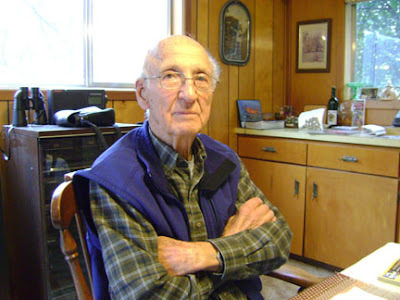 BIGFOOT BOOKS: So maybe Bob Gimlin’s recollection isn’t correct. AL HODGSON: Well, I wouldn’t say that is wrong. It’s possible. It’s possible that Roger, that Bob’s time when they left up there is a guess. Maybe no, maybe he’s wrong? I don’t know. BIGFOOT BOOKS: …you can be down in there at the film site and feel like it’s much later. C.I. : Exactly. It’s deceptively steep, and the sun disappears very quickly. BIGFOOT BOOKS: And it was getting dark, he [Gimlin] said it was already getting dark when they left. I mean, starting to, but that could have been in the afternoon with the sun disappearing behind the canyon wall. AL HODGSON: And it doesn’t take long when it starts getting dark in there. 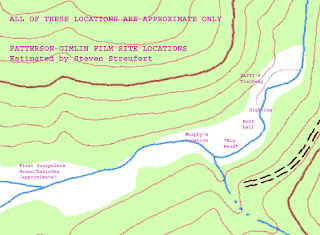 Images: Three film site location estimates, Perez after Dahinden, from Barackman, and our own rough estimate, below. Estimate only! CLICK TO ENLARGE. AL HODGSON: Yeah, but I’m not sure how long it lasted at that time. AL HODGSON: It used to be that it wasn’t quite as long as it is today. AL HODGSON: Yeah, that’s true. C.I. : Now, the area we were in, the north bank would be in shadow before 2:00, and at that point it wouldn’t look like the film does. 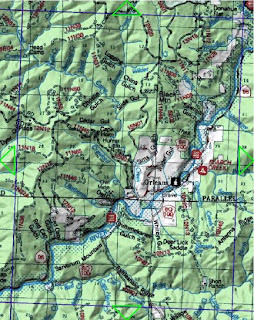 But we were operating probably more upstream than the area you’ve showed us on the map and talked about. So the light could be a lot different. We were in an area that was basically running almost due east, due west to due east. And the sun was pretty much behind us, being blocked by the ridge. C.I. : And if we were further downstream, where the creek is more north-south, then there would be more light. It wouldn’t be blocked quite as soon. BIGFOOT BOOKS: You can’t really verify it. 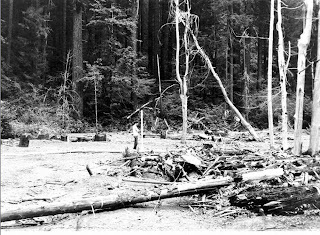 BIGFOOT BOOKS: The backhoe was up, not where MK Davis supposedly says, not down on the sandbar; but from my understanding they got out across the flooded creek, where they were camped on the opposite side of the road, and it was going up the hills toward Onion Mountain Road—there’s constant mudslides and stuff in there—that was my understanding of where they had [to use] the backhoe, up on that road there. It was used in the Blue Creek Mountain construction, not down in the creekbed. AL HODGSON: Yep, oh yeah, not, definitely not. And like I said, there’s no evidence of it being in there the next spring at all. Period. And I say I was there. I know it wasn’t. And you know something? I don’t know, some people will never be satisfied. BIGFOOT BOOKS: Yeah, they won’t. Especially the skeptics, though. BIGFOOT BOOKS: Like, I believe Roger and Bob were telling the truth. And I also look at the film and I see a real-looking creature. It’s hard to imagine it being faked. 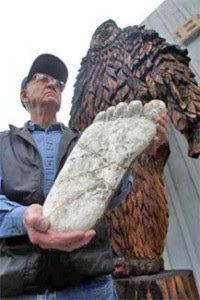 BIGFOOT BOOKS: But the skeptics write books about this stuff, and they say it must be a hoax because the timeline is wrong, or because the timeline is wrong they must be lying and therefore they massacred Bigfoots. BIGFOOT BOOKS: You know, and all these confusing, all these uncertainties lead to false ideas. So I just try to look at the simplest thing. To me the simplest thing would be to drive to Willow Creek, talk to Al, and then drive to the airport. Because the post offices would have been closed, wouldn’t they? How could they send it from the post office? AL HODGSON: Well that was something I… All I ever say is what they told me. Image: Or was the PGF sent from the airport? 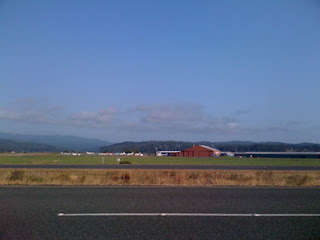 Here, Murray Field just outside of Eureka. Chris Murphy and Thomas Steenburg confirmed in 2003 that they did have 24-hour courier services available there in 1967. Photo, Steven Streufert. BIGFOOT BOOKS: But do you remember though if the post offices were open until five, or six, or perhaps a little later? BIGFOOT BOOKS: Oh, the main office may have been open late? AL HODGSON: Oh, you know, there’s something else, too. They used to have mailers for that, you could just take your film and put it in a sock, and it would go out. BIGFOOT BOOKS: A bag? A little bag to hold it? AL HODGSON: Yeah a little bag, a little thing, and you put it in this package thing... In fact that post office there had one of those there, because I’d used it. BIGFOOT BOOKS: And how would you pay for it, I mean if you were using Air Mail or Air Mail Express it must have cost a bit of money? AL HODGSON: Those bags were pre-printed, they had pre-postage on them. BIGFOOT BOOKS: Oh, so you would get them from a machine, or something? AL HODGSON: Yeah, you would get them where you got your film. C.I. : A lot of the film and the slides, it was a pre-paid mailer from Kodak or whomever made the film. BIGFOOT BOOKS: Yeah, maybe, huh? You could just drop it right in. C.I. : Yeah, but would that have gotten the film by air mail to Seattle or whatever…? AL HODGSON: Yeah, it’s one of those things that you don’t know. BIGFOOT BOOKS: I would just like to see all of the uncertainty cleared up, so we could just have the film without all of this garbage surrounding it! BIGFOOT BOOKS: You’re just one guy, and you know, and you were part of part of it. AL HODGSON: Yeah, I know. Yeah. 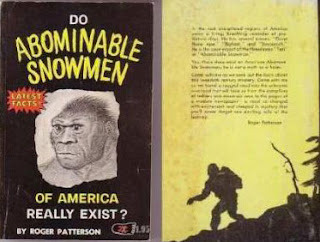 BIGFOOT BOOKS: And everyone wants Al Hodgson to come out, and like be Superman, and save us, you know? 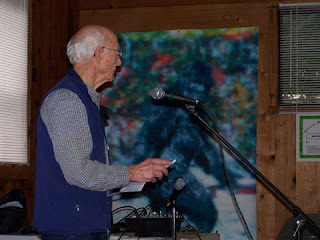 AL HODGSON: [Laughs out Loud] I laughed at this, one lady, and I can’t even remember her name right now, but she worked on this Symposium here [the 2003 International Bigfoot Symposium, which Al helped organize]. I worked with her for a while, and she got upset and quit before it was over. And she said, “Al’s a Bigfoot expert by DEFAULT, just because he was here.” [Laughs] And it’s about the truth! AL HODGSON: Yeah. But I didn’t do much. I did some, but I didn’t do that much. And I, I guess you’d say, I didn’t have a passion to do every little thing, you see what I’m saying? BIGFOOT BOOKS: You had other things going on in your life? AL HODGSON: Ah, yes, I did. 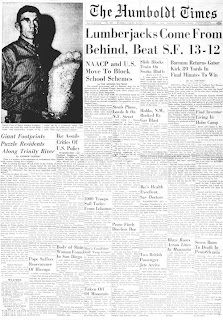 Images: A page from Jeff Meldrum's Sasquatch: Legend Meets Science, featuring Al's prints; below, Jerry Crew in the News--the original Humboldt Times 1958 article, front page, and another image of him with the track cast. BIGFOOT BOOKS: Like church and family, business… three different shop locations! AL HODGSON: Church and… business was a big thing. It took up a lot of my time. BIGFOOT BOOKS: He went to your church, as I recall? BIGFOOT BOOKS: And so he didn’t come up that second time. AL HODGSON: No uh-uh. But that’s where that went. There are other things, too, that go into this. I don’t think I’ve ever told anybody about this… but there was a fourth guy, really, that had been, in fact he was a partner of Jerry’s. And I knew him, but I didn’t realize he had anything to do with that, until I found out his wife, his widow afterwards, was really upset about it, because Jerry hogged up all this and he was left out of it. Anyway, he and Jerry worked, I think they had a Cat together [e.g., owned a Caterpillar tractor] or something, I’m not sure what it was. But anyway, I knew him before I left Arcata even, I was still working in Arcata. I got to know him, I knew his name, ah, and now I can’t remember. But anyways, I knew him. I worked for Humboldt Machine Works, and we sold him oxy-acetylene, and quite often he came in and got oxy-acetylene, and I knew him that way. But I didn’t realize he had anything to do with it, until I ran into his widow one night, or one day, in the mall in Eureka. And she told me, she was, well, I can’t remember what exactly she did tell me, but she was upset because Jerry hogged all the, uh, In fact, he was there, but, and Jerry went up on a weekend and made the film, the casts, and they left him clear out of it. And she was upset, and I haven’t… She’s since passed away. She has a daughter, and a son that lives in Redding. And I’ve talked to him once… I didn’t… oh, I know what it was, he stopped by the Museum one day, at the Bigfoot Museum. And I talked to him about it. And that’s the first I knew about it. He didn’t say much about it, he just said, well, maybe I oughtn’t to get into this. And then later I talked to his mother, his sister, and then I found out that they were upset. Because Jerry left them out of it. But I don’t know why, I don’t know anything else. BIGFOOT BOOKS: No one was really getting anything out of it, were they? AL HODGSON: No. It’s too bad, too bad it happened that way, anyway. It’s too bad. I’m gonna have to see if I can’t find out his name. I thought about it this morning, now I can’t even think of it. But the son, I think works in Redding, so if I can I will contact him. Nice guy. Nice guy, and I liked his dad, too. 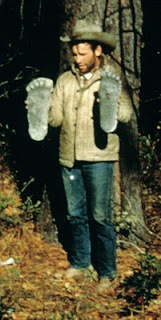 I got to know him fairly well, but I had no idea there was any connection there between, on Bigfoot at all. But it turned out to be, Jerry was well known…. Another one that was Jess, oh, Jess Beamis is the one I was thinking of, and can’t think of what the name of his son was. Jess was the father and then the name of his son was Beamis, but I can’t remember what it was. But the other guy I was thinking of was Jess Pascal. He was the one that was with Jerry when he made the casts. And he had a cast, but he never, he kind of stayed out of it. BIGFOOT BOOKS: Now, these guys weren’t trying to get rich and famous or anything? 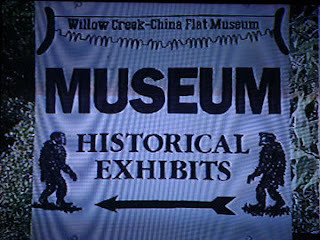 Image: The Willow Creek-China Flat Museum's Jerry Crew display. BIGFOOT BOOKS: Like church camp? AL HODGSON: Down here for ah [unintelligible], and he’d take ‘em home, and so, he was a nice kind of guy. And his wife, Ruth, she could whistle, and she could whistle a tune. Beautiful. It was a treat to hear her whistle. BIGFOOT BOOKS: Did you whistle for Sasquatches? AL HODGSON: [Laughs] Ah, I don’t know about that, but could whistle, she’d just whistle tunes. But Jerry was a nice guy. I liked Jerry. And I liked Jess Beamis, too, by the way, and his partner Jess Pascal. But Jess and his brother, they were nice guys, but they were…. They worked for Charles Whitson, down here, where the Whitson’s are at, they worked for him. Image: Another image of the film site, taken from the dirt logging spur road above. BIGFOOT BOOKS: Whitson the plumber? 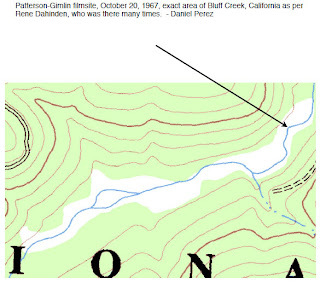 Image: Yet another Bluff Creek map, this one in wider scale, film site above the second "NA" in "National." COMING UP NEXT WEEK, same Squatch Time, same Squatch Channel, More Odd Questions for Al: How did they get Sasquatches onto Noah’s Ark? How did Noah find them in the first place? And much, much MORE! PART THREE TO FOLLOW SOON, SO KEEP CHECKING BACK (or just subscribe)! UPDATE!!! PART THREE of the INTERVIEW is now up! Available HERE. And, man, is he pissed! You should see his dreams. Con-texts of this blog, save for archival or historical images ("fair use" for research), copyright 2010, Bigfoot Books Intergalactic and Steven Streufert.